Construction plans, logs and progress meetings should not take up all day, everyday. This particular morning included some “Green Eggs and Ham.” Our staff welcomes all types of opportunities to participate in community activities. 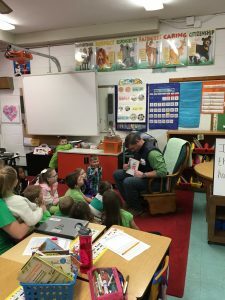 Friday, March 3rd, celebrated Read Across America and G&H’s Troy Henderson had the opportunity to read to Glenvar Elementary students courtesy of Glenvar Elementary’s librarian Kathy Rakes.